FOX Releases First-Ever Alien Action Figures Including Ripley - Are You Screening? Alien fans rejoice, and keep your eyes peeled, because you’re about to get a shot at some action figures. Not only are you about to get your shot at the first-ever Ripley figure, but a whole slew of other merchandise is coming, by way of several companies. The 35th Anniversary of the film is really a pretty big deal, especially if you consider the fans that still hold onto the film, and the extent to which Alien (and the sequels) hold up over time. Check out all the info below, and start putting away money now. The action figures are one thing, and NECA and Sideshow Collectibles make some fantastic products, but you’ve also go a card game, video game, a line of ornaments, and just about anything else you could want. 35 years later, fans are still “screaming” in space as Twentieth Century Fox Consumer Products celebrates the 35th anniversary of the ground-breaking film ALIEN, one of the most enduring sci-fi horror franchises of all time, with multiple iconic partners for exclusive branded merchandise available worldwide. Dark Horse Comics – A new comics program will debut later this year which includes Alien, Prometheus, Predator and Aliens vs. Predator. 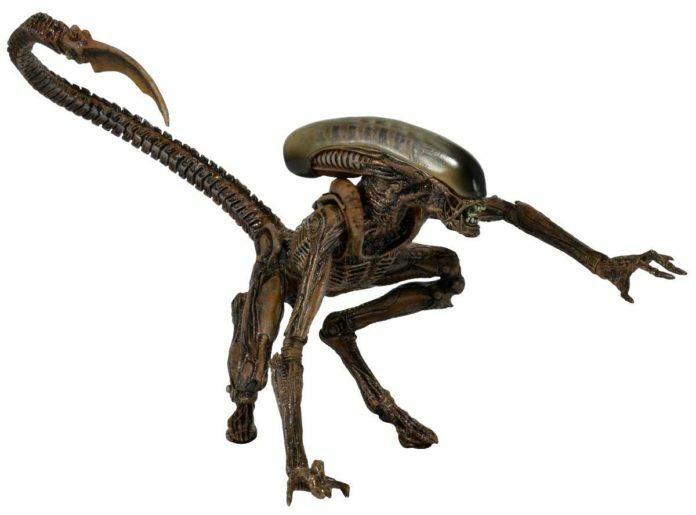 Diamond Select Toys and Collectibles – New collectibles including MiniMates block figures, vinyl banks, bottle openers and a reproduction of the original 18-inch Alien figure, available this summer/fall. NECA – Figures, board games, bobbleheads, plush and toys will hit major retail stores beginning in March 2014. Prototypes of the Ripley figures will debut later this summer at San Diego Comic-Con. SEGA – The highly-anticipated first person survival horror game Alien: Isolation will be available on PS4, Xbox One, PS3, Xbox 360 and PC in late 2014. Sideshow Collectibles – High end, limited edition Alien franchise products, including an immense bust of the Big Chap Alien design, available for pre-order in April 2014! Check out www.SideshowCollectibles.com for Alien Franchise products, and more! Titan Books will release all-new canon fiction novels based on the film franchise, followed by a 35th anniversary retrospective called “ALIEN: Archives” which will be the most comprehensive book ever created about the ALIEN franchise with new exclusive interviews with Ridley Scott and Sigourney Weaver and content that has never been released. Other partners include Hollywood Collectibles for highly-detailed prop replicas, Upper Deck for an all-new collectible card game, Hallmark for ornaments, Square Enix for Aliens: Colonial Marines Play Arts KAI action figures, Titan Merchandise for stylized mini vinyl figurines, Rizzoli for wall calendars and Rubie’s Costume Company for amazingly detailed Halloween costumes in addition to even more partners with apparel and additional collectible merchandise to be released throughout the year.